Trump has reiterated his calls for the U.S. to impose the death penalty on drug dealers, praising countries like the Philippines, China and Singapore that do this. During a speech on Saturday, Trump said these governments solved their drug problems by executing drug traffickers. President Trump has reiterated his calls for the U.S. to impose the death penalty on drug dealers, praising countries like the Philippines, China and Singapore that apply capital punishment to drug traffickers. During a speech on Saturday, Trump recounted conversations with Chinese and Singaporean leaders who, he said, solved their countries’ drug problems by executing drug traffickers. 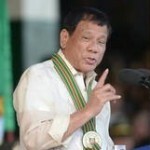 Trump has also repeatedly expressed admiration for Philippines President Rodrigo Duterte and said he’s done an “unbelievable job on the drug problem.” Last month, the International Criminal Court opened a preliminary investigation into accusations that Duterte had committed crimes against humanity by overseeing the killing of up to 8,000 people in his so-called war on drugs. As special counsel Robert Mueller continues his probe into Russian meddling in the 2016 election, we take a look back at Washington’s record of meddling in elections across the globe. By one count, the United States has interfered in more than 80 foreign elections between 1946 and 2000. And that doesn’t count U.S.-backed coups and invasions. Former CIA Director James Woolsey recently admitted the U.S. meddles in overseas elections. During an interview with Laura Ingraham on Fox News, Woolsey laughed about it and said the U.S. takes such action “only for a very good cause.” Woolsey made the comments shortly after 13 Russians were indicted for interfering with the U.S. election.